Hit several Big Island highlights on a tour that mixes intriguing history, local products and dazzling scenery. 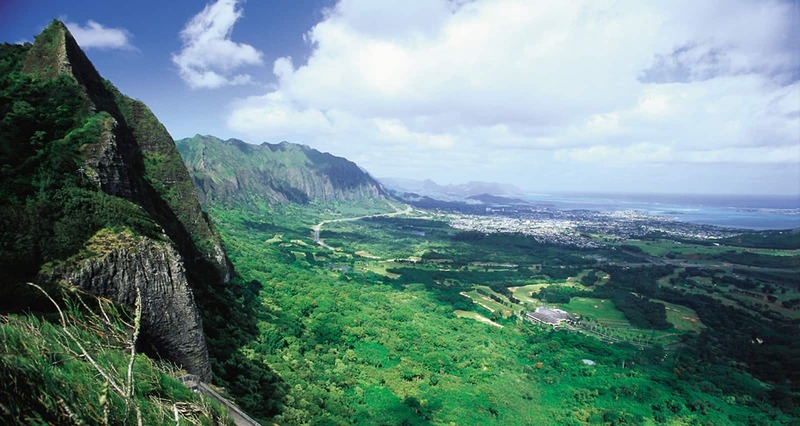 Circumnavigate the island of Hawai'i on a satisfying 260-mile tour from Kona to Hilo.<#contentBreak> Your expert driver and guide will share with you the legends and cultural significance of the famous sites and point out numerous scenic wonders along the way. Fly from O'ahu to Kona for a 1-day sightseeing adventure around the Big Island of Hawai'i in an air-conditioned motorcoach with expert narration from the driver/guide. Visit the Royal Kona Coffee Mill & Museum—the headquarters of renowned Royal Kona Coffee. Enjoy a unique immersion experience into Hawaiian culture at Puuhonua o Honaunau National Historical Park. Known as the "Place of Refuge," this park was once royal grounds and and a safe haven for ancient Hawaiian lawbreakers. Guests will spend approximately one hour exploring the park, including an ancient fishpond and several heiaus (sacred temples). See Mauna Loa Volcano off in the distance as you head to the gorgeous Punalu'u Black Sand Beach. Head to the Hilo Hawaiian Hotel with its Queen's Court Restaurant, where you'll enjoy lunch on your own. On the way, your guide will point out Hawai'i Volcanoes National Park and Liliuokalani Botanical Garden as you drive by. Have a sugary sweet time at Big Island Candy Company, the home of exquisite chocolate and macadamia nut treats. Following your trip to the candy company, you'll stop and enjoy the natural beauty of 2 waterfalls, Rainbow Falls and Akaka Falls. On your way back to Kona, you'll stop at Hamakua Macadamia Nut Farms and watch how these delicious macadamia nuts are roasted to perfection. Guests are encouraged to wear a lightweight jacket and sturdy, closed-toe shoes, as the tour includes travel over sharp, uneven lava surfaces. This tour is non-refundable and cannot be changed once tickets are issued. No transportation is provided from Aulani Disney Resort. Check in at the Hawaiian Airlines Terminal at the Honolulu International Airport.